The Datalogic Falcon 330 utilizes open standards to create powerful applications and an ease of integration into the supply chain systems of companies involved in logistics, manufacturing, retail, warehousing and distribution. The Falcon 330 has a sleek, environmentally sealed case, built-in, front-shooting laser. Its powerful 486 processor, running at 33 MHz, operates under DOS 6.2. 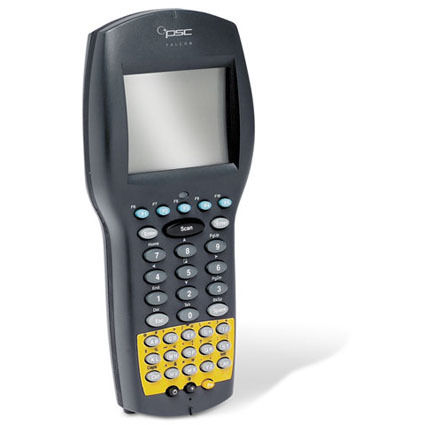 The Falcon 330/335 comes with 8 MB of RAM standard, 2 MB of Flash ROM, a PC Card Slot, a 16-line screen and 38 key alphanumeric keypad. Open architecture ensures easy application development. And the Falcon 330/335 is available with PowerNet TN to support VT100, VT220, HP700/92, IBM 3270 and IBM 5250 terminal emulations with screen formatter, allowing swift and simple integration into your existing legacy system. The Falcon 330 has been Discontinued. Please call for a recommended replacement. Dimensions (W x D x H): 3.4" x 7.8" x 1.4"